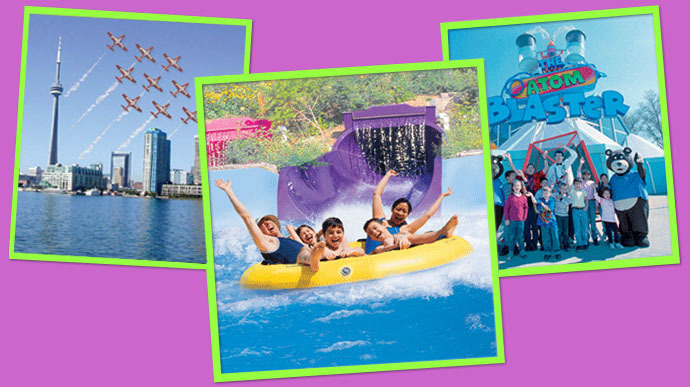 Make Ontario Place your summer attraction destination. Ontario Place offers Rides, Movies, Music, Sports, Helicopters, Boats, Dining, Nightclubs, Air Show, Fireworks - a 7 minute drive from downtown Toronto - Ontario Place is just for you! Ontario Place - Toronto's favourite summer spot is filled with rides for dare devils and wee ones alike, all with a lake-view as a back drop! Thrill seekers - Dare to take the plunge? This is the coolest ride for the hottest days, shoot down a tube on a thin sheet of water at 50 kph. How about the not so crazy Rush River Raft Ride? Relaxing summer nights by the water - visit the restaurants and nightclubs. Ontario Place is Toronto's summer fun hot spot. Just across the street from the CNE, Ontario Place is the perfect place to unwind. Ontario Place is also the perfect place to watch Toronto's best fireworks show - the Festival of Fire. Ontario Place is an internationally acclaimed cultural, leisure and entertainment parkland located in Toronto, Ontario, Canada. Ontario Place's IMAX Cinesphere has the largest screen in the Greater Toronto Area. The IMAX Cinesphere pumps out 24,000 watts of digital sound and is the place you will want to watch IMAX films and the latest Hollywood releases. Ontario Place is the home of the Atlantis Pavilion, a spectacular venue flaunting incredible views of Toronto, a nightclub, restaurants, a roof-top patio and special events. Ontario Place grounds are the place to be as the Molson Amphitheatre hosts some of the most spectacular events in Toronto. Sure to be a rockin' this summer. Ontario Place boasts a spectacular marina of 300 slips just minutes from downtown Toronto and the excitement of Ontario Place park grounds. Surrounded by Ontario Place's immaculately landscaped islands, simply dock your boat and visit one of the wide range of restaurants and licensed patios. Ontario Place opened to the public on May 22, 1971 and featured a five-pod pavilion complex. An estimated 1.5 million person hours of labour and $ 29 million is what it took to build Ontario Place. With over 30 years of providing family fun every summer season, Ontario Place is the place to be this summer.